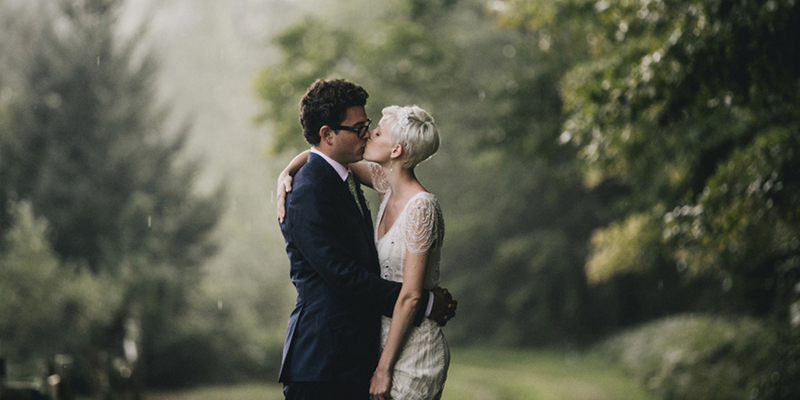 Ellie's cousin Betsy married Raul on his family farm in the Catskills of New York, and we were honored to help with their wedding invitations, monogram, and programs. The wedding was memorable and sweet, full of DIY projects with help from friends and family. Betsy and Raul wisely chose all their DIY projects not to save money (and obviously, not to save time) but because they wanted a personal touch to their wedding that money just can’t buy. With Betsy's wedding invitations, we explored many options, including incorporating textile patterns from Betsy's grandmother's house. 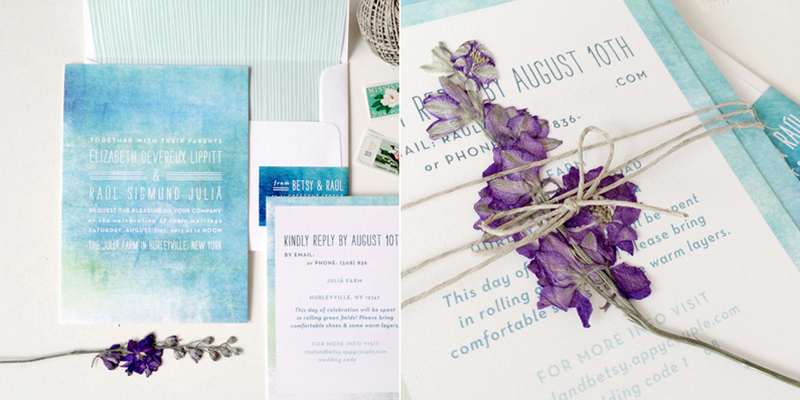 In the end, we chose a watercolor theme, which reminded Betsy of her grandfather's love for painting, and modern, quirky fonts to match the casual feel of their farm wedding. Betsy planned to decorate tables with local wildflowers, so we included dried flowers inside each envelope and wrapped it all together with twine. For the wedding day, we designed fan programs which included a map of the farm drawn by Raul’s brother. As a surprise for the couple, Ellie and Betsy's father, Mark, worked together to create a wedding monogram which Mark branded onto the bottom of birch trees turned candle favors. "Working with Ellie was a dream come true for me. Full disclosure: yes, I am her cousin so I'm biased. But I wouldn't have trusted our wedding invitations to just anyone, family or not! I love that Ellie's work is playful and sophisticated at the same time. I wanted our wedding invitations to feel modern and natural, while also recognizing it as the most special, awesome, best day of our lives! Each step of the process went smoothly and Ellie made it so easy (even when I didn't know exactly what I wanted!). We loved incorporating personal elements into the design of all our paper goods & no task or question went unanswered or unexplored. Ellie is a pro, not to mention a lovely person who takes the stress & worry out of the process! What more can a bride ask for?" More photos and details on Green Wedding Shoes.